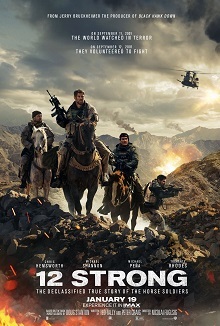 Set in the immediate aftermath of the 9/11 terrorist attacks, ’12 Strong’ tells the story of one of the first American combat units who took the fight to the Taliban in Afghanistan. The title refers to the unit of only 12 men, led by Chris Hemsworth’s rookie captain Mitch Nelson who is undertaking his first operation in the field, alongside a cast containing the likes of Michael Shannon and Michael Pena. Their mission is to identify Taliban strongholds and provide their coordinates to air support to bomb, but to get close enough, they need support from the Northern Alliance, a collection of guerrilla armies who share the same disdain for the Taliban. My enemy’s enemy is my friend has never felt more appropriate. General Abdul Rashid Dostum (Navid Negahban) is the unit’s contact within the Northern Alliance, a battle weary soldier who has spent most of his life fighting the Taliban. He’s superbly played by Negahban (who was a standout in TV’s ‘Homeland’) and he is presented as a morally complex person, caught somewhere between freedom fighter and warlord, and I’d have loved to find out more about him. That is partly where ’12 Strong’ disappoints, as it rarely seems interested in exploring the setting in any great depth and it paints a very one dimensional portrait of the war in Afghanistan by failing to contextualise the consequences of America’s involvement. The tangled web of Afghan politics and the various warring tribes is introduced merely as a challenge to Nelson’s unit, with little nuance shown to what is a landscape complicated by history and the effects of various wars. As an action film, ’12 Strong’ often excels, with the challenging geography and difficult terrain presenting the filmmakers with the opportunity to explore some unconventional tactics for a film about modern warfare, and I felt it delivered a strong degree of excitement and intensity as the battle rages. When it focuses on the action, ’12 Strong’ is an often thrilling tale of bravery, but when you choose the setting of the War in Afghanistan, I feel there is an obligation to explore or at least reference the wider political connotations and ’12 Strong’ has limited interest in doing so. On that basis the film settles for approaching good rather than approaching great, which is fine, but I did feel like there is a really good film to be made out of the bones of this material, and unfortunately ’12 Strong’ is not it.